If you are unhappy with your smile, you might be a good candidate for teeth bleaching. Commonly referred to as teeth whitening, this process changes the color of the teeth by removing stains. Familiarize yourself with the process to determine if it is a good option for you. During the teeth bleaching process, a bleaching agent is used to break up stains. As the stains break up, they are no longer as concentrated, making the teeth appear significantly whiter. People can use one of two bleaching agents during this process. Teeth whitening kits contain hydrogen peroxide or carbamide peroxide. Both work the same way. People have lots of choices for teeth bleaching, but these options fall into one of three categories. People can get a treatment at the dentist office, use at-home bleaching kit courtesy of the dentist or purchase an over-the-counter whitening product. The results differ depending on the category selected. In-office teeth bleaching is a popular option for people who have unsightly stains. Dentists use a rubber shield or gel to protect the gums and then apply the bleach. An LED light might be used to speed up the bleaching process. In-office bleaching lightens teeth by as much as seven shades in the span of an hour. Dentists also offer at-home kits for their patients to use. Patients use the trays daily for two weeks. At the end of the two weeks, their teeth are up to seven shades lighter. These kits are as effective as in-office whitening, but it takes longer to get the results. 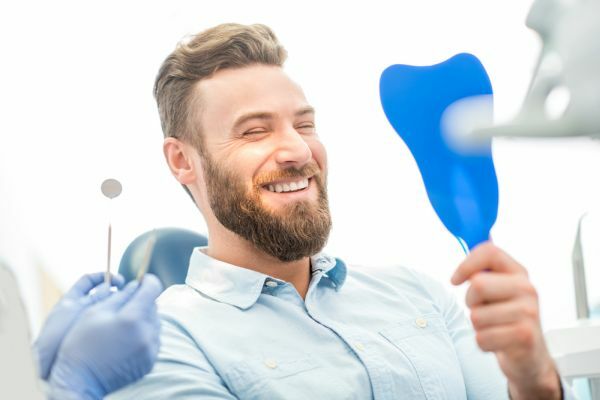 Those who want to forgo a trip to the dentist can use over-the-counter whitening products such as kits, whitening toothpastes and whitening strips. These products are not as powerful as what is available at the dentist, so the kits are not able to provide the same type of results. Also, those results typically do not last as long with an over-the-counter kit. Yellow teeth are the most responsive to teeth bleaching, but whitening products can work on brown teeth. However, brown teeth are not as responsive, so the results might not be as desired. Teeth with gray tones usually are not responsive to teeth bleaching. Also, bleaching does not work on fillings, crowns or veneers. It is important to keep dental work stain-free, or it must be replaced to make the teeth white again. Is teeth whitening the right choice? Teeth bleaching can reduce staining on some teeth. People have multiple options for whitening their teeth, but bleaching agents provided by the dentist are the most effective. If you are unsure if teeth whitening will remove or reduce the stains on your teeth, contact your dentist. The dentist will examine your teeth and help you decide if this procedure will provide the desired results. Are you considering teeth bleaching in the East Orange area? Get more information at https://www.qualitygentledentalcare.com. « What Are the Warning Signs of Gum Disease?